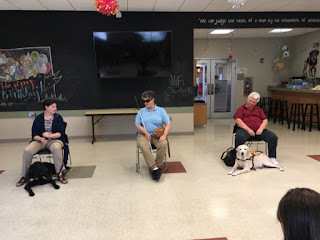 Dixie Land Guide Dog Users: Midsummer "Pupdates"
We Dixie Land Guide Dog Users have kept our "paws 2 the pavement" this year as together we discover new paths toward education, advocacy and keeping our families focused on each other. Earlier this spring, we were contacted by the Oconee County, SC 4H Program. 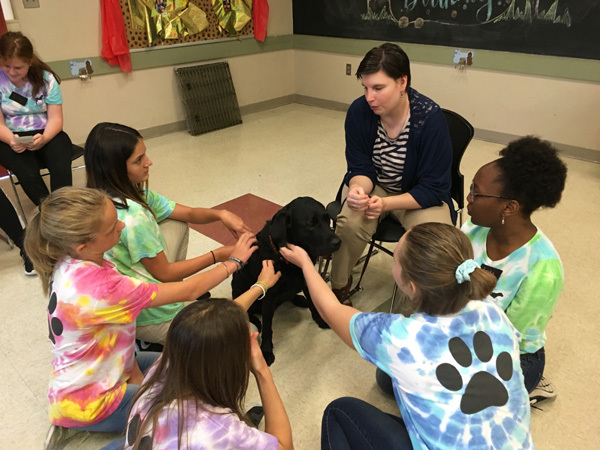 The program's Bark Buddies Club has been studying service dogs and wanted to learn more about guide dogs in particular. Audrey and Laurel made an appearance at the group's May meeting via Skype. It was our organization's first time presenting via Skype, and we look forward to many more presentations like this in the future. As many of our readers already know, Charleston will be the host city for Top Dog-2019. 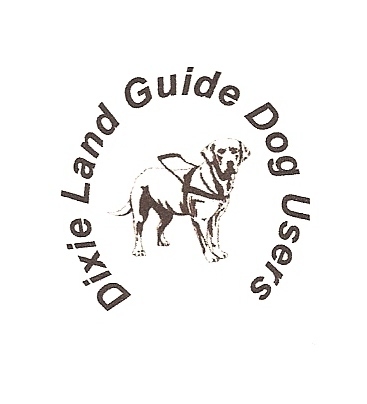 The Southeast Region Top Dog Workshops are a collaborated effort among Guide Dog Users of Florida, Georgia and Dixie Land Guide Dog Users here in South Carolina. It's Top Dog Number 10 and it's coming home again, so be sure to check this site regularly for updates! It has been our joy to assist our extended family of Guide Dog Users Inc. in shipping healing prayer blankets to our brothers and sisters in the blindness community affected by personal hardship, the illness or loss of a human family member or that of a current or retired guide dog. The blankets come from the kind folks at Epiphany Catholic Church in Louisville, KY and were first introduced to our extended GDUI family at the organization's 2017 National convention in Sparks, Nevada. These blankets are truly a blessing to all who receive them. Many within the blindness community deal with the challenges of isolation. The majority of guide dog users are on a limited income. When a guide dog retires and it is time for the handler to receive a new dog, most cannot keep their previous guide with them. There is a desperate need for blessing and closure among the worldwide community of guide dog users, and we are grateful for this opportunity to empathize with our fellow handlers and their guides. The National GDUI Convention took place this year in St. Louis, MO. We were pleased to collaborate on promotional writing for this event. The imaginary antics of the "Nylaphone Pawty Line" and the "Whimsical Guide Dog Radio" brought smiles and wags alike as the journey continued with those "rovering reporters, Fred Floppears and Colleen Curleytail." We were honored beyond words by our extended family, as our President was recognized with the distinguished Lieberg-Metz Award for writing and media promotions of the guide dog movement. In North Carolina, Dixie Landers Glenn and Donna Permar have just returned from the national American Council of the Blind/GDUI Convention. They continue to make a difference in their community, doing presentations to the Go Durham new bus operators on how to interact with customers who are blind as well as presentations to the Duke School of Nursing on interacting with patients who are blind or low vision. Back here in Charleston, children are enjoying the many learning opportunities offered by summer day camps throughout the Lowcountry area. Here, Kimberly with guide Fonzie and Audrey with guide Jessie are shown talking with sighted students ages twelve to fifteen who attend the Pet Partners camp offered by the Charleston Animal Society. The kids always ask a lot of great questions, but the highlight of our visit is the off-harness time that the kids enjoy with Jessie and Fonzie. Our thanks to Laurel with her trusty white cane "Lady Liberty" for moderating these talks. Kimberly has been teaching sensitivity and awareness to her therapeutic riding instructors. Brianna is in New York, helping young people navigate the college environment independently for the first time. Sheryl continues to be active in her church and on her farm. Across the miles or just down the road, Dixie Landers are promoting one community at large among the sighted and the blind. Please visit often as we share more posts like this one.